The sun sends us [free] warm, energetic beams every day. 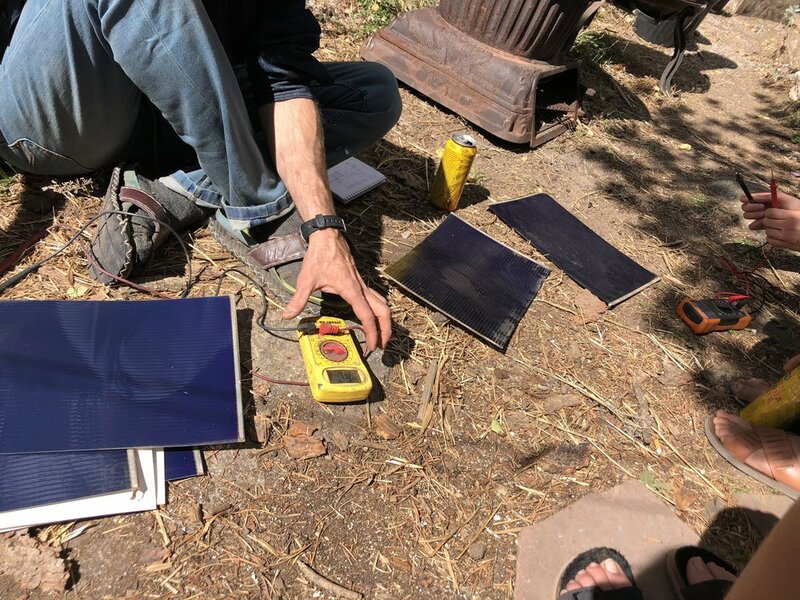 Similarly, “pay it forward” was the payment request of Greg Willson- teacher, social and creative engineer, solar expeditioner, computer programmer and all around DIYer- when he offered to host a Solutions Voyage workshop at his house in Nederland, CO. He charged no money for the 3 hour workshop (we were all grateful!) with the hopes that we’d use our new found skills to help another person or community become empowered to install solar. Using affordable- non glass-housed solar panels from the internet, a small group of us were able to play with components to create a small DC system- one that cost around $10 and could power a small LED light. Panel> Wire> Light! A little toying with the system… and voila!! ….How many panels would one need? How would a battery fit in to the system? What if we were to run larger appliances on the system? These were the questions that we learned how to navigate. The LED system puzzle that we had to figure out gave us a foundation for understanding and using Ohm’s Law- Volts x Amps = Watts - the fundamental equation to calculate electrical systems loads. We worked to find the wattage of that small system, and then learned that we could apply the same problem solving skills to larger systems. After taking the workshop, we even made a little system to power up a cafe in Ethiopia! The pay-it-forward plan worked… Renewable resources come in many forms!